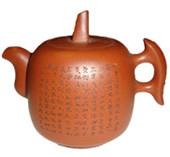 Yixing teapots are made from unglazed stoneware, called 'purple sand' or 'Zisha' in Chinese. 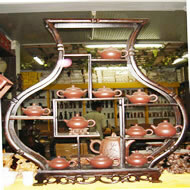 Artistic potters have been creating teapots in many ingenious shapes--a pumpkin, a calabash, a bell, flowers and so on. Some of them are decorated with verses in fine calligraphy and a vivid animal. We believe that those pots develop rich patinae and enhance the taste and aroma to bring out the best of the fine teas (See statistics). 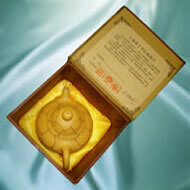 The following single teapots are named and sealed by original potters and are attached with their authentic certifications. Item No. TP1531 "Royal Teapot"
Item No. TP1546 "Blue Rooster Teapot"
Item No. TP1532 "Global Weather Teapot"
Item No. TP1533 "Flower Paradise Teapot"
Item No. TP1549 "Calabash Teapot"
Item No. TP1534 "Pumpkin Paradise Teapot"
Item No. TP1536 "First Officer Teapot"
Item No. TP1537 "Blue Horse Teapot"
Item No. TP1538 "Bamboo Teapot"
Item No. TP1550 "Yellow Bell Teapot"
Item No. TP1540 "Pan Teapot"
Item No. TP1539 "Bamboo Ring Teapot"
Item No. TP1542 "Tiger Teapot"
Item No. TP1545 "Blue Ox Teapot"
Item No. TP1543 "Crabapple Teapot"
Item No. TP1544 "Round-Square Teapot"
Item No. TP1547 "Pear Teapot"